Ecosystem decline can include catchment salinity, vegetation decline, weed proliferation, invasion of pest animals and stream decline. Catchment salinity is where changes in the water balance of a catchment mobilises salt stores and concentrates the salts in low lying parts of the catchment. This concentration results in damage to vegetative cover and surface waters. 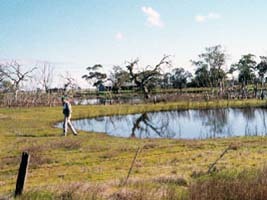 An illustration is given on the Soil and landscape assessment in the upper Bet Bet Creek catchment page. Further information is available at the salinity management page. 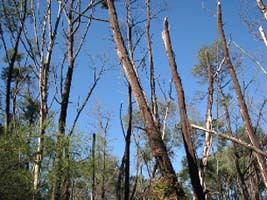 Vegetation decline describes both the loss of mass and diversity of vegetation in the landscape. It also covers any increase in weediness of the vegetative structure. Weed proliferation is the excess growth of undesirable plants such that intervention is required to reduce harm to the environment, the economy, human health or amenity. 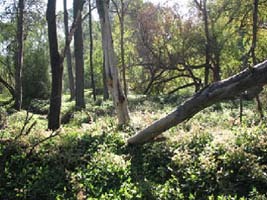 Further information is available in the Invasive Plants section.